Enjoy built-in, ready-to-use software no installation required. Recharge your battery pack via USB connection no power adapter or AA batteries needed. Save desk space with compact design. Customize labels with fonts and graphics on your computer through PC or Mac* connection. With the LabelManager PnP label maker, theres no software to install just plug it into your PC or Mac and youre ready to create great-looking labels as fast as you can type. This label makers built-in software pops up on your computer screen so you can instantly print clear, professional-looking labels for your file folders, supplies, binders, media, presentation materials and more. You can customize your labels using the fonts and graphics on your computer. 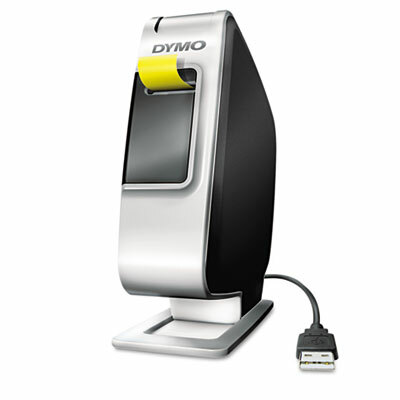 Plus, the LabelManager PnP is lightweight and compact, so it works just as easily on-the-go, needing only a USB connection to recharge its battery. Its the fast, easy way to create custom labels. Compatible with Windows 7 or later and Mac OS X v10.8 or later. Connectivity: USB Disclaimer Statement: Microsoft and Windows are either registered trademarks or trademarks of Microsoft Corporation in the United States and/or other countries. Mac and OS X are trademarks of Apple Inc., registered in the U.S. and other countries. Machine Depth: 5 3/10" Machine Height: 5 3/5"
Prints Postage: No Tape Size: 1/4" 3/8" 1/2"